How does new foundation connects to existing? 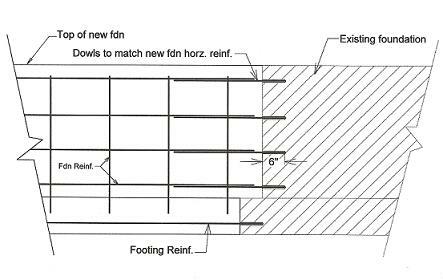 The detail below is typical connection between new and existing foundation, footing. The detail calls for all the horizontal reinforcements to be drilled and epoxied into the the existing footing and foundations. For residential construction, most of these horizontal reinforcements are #4 bars. The depth of the drilled holes vary depending on the diameter of the dowels, for #4 bars, its between 4 and 6 inches deep. The intend of the dowels are to pull together the old and new concrete together such that their bonding become inseparable. Some engineers require the edges of the existing footings and foundations where the new and old concrete meet be roughened. Even some require application of bonding agent to enhance the bonding. Since most footings and foundations are coated with waterproofing, the waterproofing must be removed and scraped clean to allow concrete to concrete bonding. Failure to do this will yield weak connection and can lead to water leakage. The longer side of the dowel also call the lap splice, is calculated by multiplying the bar diameter in inches by 40. For #4 bars, it requires 20 inches long lab splice. During the pour make sure these connection points are vibrated really well to make sure there are no honeycomb or exposed reinforcements.